Nick - Essentially, these vents microporous labyrinths of interconnected pores, and the pores have got very thin inorganic walls around them. ‘That’s what the barrier is, the walls around these pores, and the pores may be a few micrometres across, and perhaps just a micron thick. So they’re bigger than cells but we’re getting down to a cell-like size and it has the same structure as cells, that’s what’s intriguing about it. You essentially have a pore with a barrier around it that’s equivalent to the cell membrane and, effectively, a charge on that barrier. So we have a kind of topology which is equivalent to cells. Georgia - Right. You think this kind of structure, the fact that it’s similar to cells and it’s got this barrier like a cell would have a membrane, means that it’s possible these were where life started? Nick - That’s my view. You would find lots of people who would sweep that aside. Georgia - Nick believes that we might be missing something when running simulations of how these first organic molecules were created. And that missing piece of the puzzle, is looking at how cells do it today, which is through using carbon dioxide and hydrogen for energy, powered by an electrical charge on their membranes. Nick - The simplest cells like methanogens, for example, they live from carbon dioxide and hydrogen, so just gases. The kind of gasses that just bubble out of the ground. 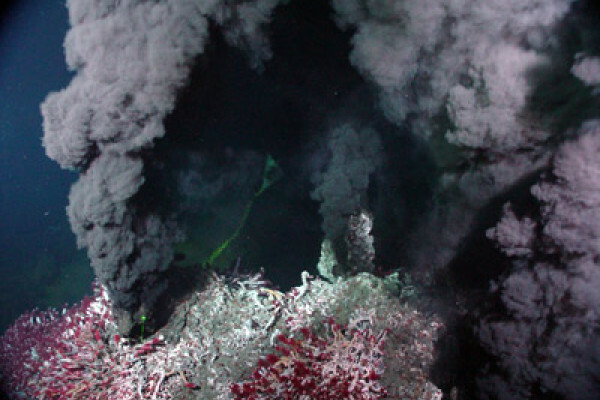 In fact, hydrogen gas just bubbles out of hydrothermal vents. They don’t react easily, hydrogen and CO2; if they did we could probably fix global warming by stripping CO2 out of the air, and we could fix the energy crisis by making synthetic gasoline. So I’m sure people have been looking at this behind closed doors for a long time. But this is what methanogens do, and to get them to react they use some of the simplest, most ancient proteins that we know about. Things like ferredoxin, which are iron sulphur proteins and the cofactor that does the chemistry is, in fact, a very small mineral made of iron and sulphur. These are the kind of minerals that form spontaneously in the vents we’re interested in. The other thing that the methanogens do is they use this electrical charge on the membrane, as well as these iron sulphur proteins to drive the reaction between hydrogen and carbon dioxide. That’s what I think could happen spontaneously in the vents because those natural structures, barriers including these iron sulphide minerals are natural proton gradients that are equivalent to the charge on the membrane. So the prediction is that it ought to drive that reaction and, if it does, then we can look for organic molecules being formed that way. Georgia - So the hydrothermal vents provides us with a network of pores, similar to cells, a natural charge on the barriers, which could drive reactions, and they’re rich in the chemicals which are used by all cells today to grow. So can we recreate this environment to look for these reactions? Nick - We would love to do that. The issue, of course, is that these vents can be 60 metres tall. Today, the few that we know about, come in field which can be kilometres square across, and we think 4 billion years ago that they could have spread all across the entire sea floor. So the whole planet becomes a chemistry lab from that point of view. And there’s millions of years to spare, and there’s high pressures, and high concentrations of hydrogen, so to try and do it in the lab is a joke in the sense that we cannot possibly simulate very much of that. But what we can simulate is the structure. In effect, what you have barriers containing iron sulphur minerals and those are semiconducting, which means electrons can pass across this barrier. One one side we have a simulated an alkaline hydrothermal fluids, the kind of things that we see in the vents today down at the bottom of the oceans. On the other side, what we think would have been an acidic early ocean, mildly acidic - maybe Ph6 or something - with lots of carbon dioxide in it. The idea is that that difference in Ph (difference in acidity) will help drive that reaction transferring electrons across the barrier. So that’s the kind of experiment that’s relatively easy, conceptually at least, to set up in the lab. The reality is that even very simple systems turn out to be more complex than you can really control. Georgia - Have you had any results yet? Nick - It looks as if we are able to make simple organic molecules, and from those simple organic molecules it’s relatively easy to go on and produce more complex ones like, for example, ribose or deoxyribose, which are the sugars used in DNA and RNA. There’s so many steps, that we’re really probing the ones that seem easiest for us to do at any one time rather than the most coherent set of rational steps, we’re doing the ones we can actually do. So there’s big gaps everywhere and we’re trying to repeat a lot of what we’ve already done. I suppose the normal scepticism is if you can’t repeat everything with different people doing the same experiments then you begin to worry that someone did it wrong, or there was some reason why it’s not believable. You realise when you’re looking for a tiny amounts of trace substances that are actually found on everybody’s breath, for example, you’ve got to be really careful. It’s very easy to make a fool of yourself by thinking you’ve made something when it turns out that you didn’t at all. It as just on someone’s breath. Previous Did life come from space?